This job certainly has its perks. 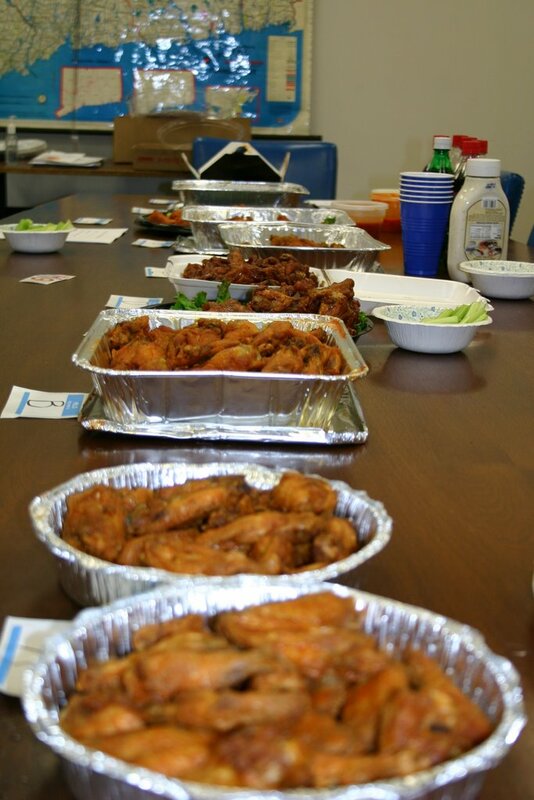 The good folks at Play magazine invited me to be one of the judges for its annual best buffalo wings contest, a.k.a The Quest for the Golden Chicken. I'm not completely sure why they asked me, but I suppose the connection between sports writer and devouring massive quantities of buffalo wings seems like a natural stereotype. It's true, I have eaten my share over the years. But I wasn't about to ask questions for fear they might change their minds. I was only too happy to oblige the request. The contest is pretty simple. Over a dozen establishments from around the state entered mounds and mounds of their signature wings, each doused with secret sauces and spices then cooked to perfection. The judges -- Chris Charist of Live Nation, Patrick Palmieri, president of Palmieri Foods and myself -- tasted and graded them all. The results will be tabulated with the winner (and the presentation of the coveted Golden Chicken trophy) to be announced in an upcoming issue of Play. Just before the gluttony commenced, I decided to bill myself as the Simon Cowell of the competition -- ready to tell it exactly like it is by being brutally honest. But I realized it's not that easy to be a food critic. Somewhere around round eight, I started running out of different ways to describe what I was tasting. Maybe it was because the inside of my mouth had been numbed by several helpings of eyebrow-singing fire wings. Maybe it was because most of them tasted exactly the same to my untrained and blistering palate. At any rate, I went from being an insightful Simon Cowell to monotonous Randy Jackson ("these are good, dog") in about 20 minutes. I knew I should have taken notes while watching the Iron Chef. I learned a couple of other things, too. A) There is such a thing as eating too many wings in one sitting, something I didn't think was possible as recently as five years ago. My heartburn has heartburn. Guess I'm getting old. B) No matter how many times you scrub and wash and scrub again, that hot wings smell won't completely leave your fingers for at least 24 hours. C) my breath could burn through steel. D) I won't be able to eat another wing for at least, oh, a couple of days. UConn will introduce its early enrollees to the media at a press conference on Friday afternoon. Jarrell Miller and Tyler Lorenzen are the prize recruits. Nothing new to report on the Notre Dame front. There have been discussions as to a series with UConn, but nothing concrete. Yet. But it will happen. Got a correction from, of all people, my mom. Well, in a roundabout sort of way (she isn't exactly internet savvy enough to find this blog). In my last entry I mentioned how Frank Stallone sang Sinatra's "My Way" before a Vinny Paz boxing match. Turns out Paul Anka wrote the song. She mentioned that little tidbit while raving about the Paul Anka show at Mohegan Sun last week. Guess he was rocking the 60-somethings.